Abell 1367 cluster. The background image is R-band of Palomar Digitized Sky Survey 2 (DSS2). The size of the image is 75 arcmin square. The solid boxes represent the observed regions in this study. Credit: Yagi et al., 2017. (Phys.org)—Astronomers have found six new extended ionized gas clouds (EIGs) in the galaxy cluster Abell 1367 (also known as the Leo Cluster). The discovery expands the current list of the cluster's known EIGs to 11 and provides new clues about the evolution of this group of galaxies. The researchers detailed their findings in a paper published Mar. 30 on arXiv.org. Located some 330 million light years away in the constellation Leo, Abell 1367 is a young cluster containing at least 70 major galaxies. The cluster is best known for its high fraction of spiral galaxies, low central galaxy density and the irregular shape of hot gas distribution. Moreover, Abell 1367 is one of the best-studied nearby clusters in H-alpha (Hα) spectral line. To date, numerous Hα observations of this cluster have been conducted with the aim of detecting the presence of ionized gas. Such studies are of high importance for astronomers due to the fact that gas around a galaxy in a cluster is an indicator of a recent or ongoing gas-loss event of the parent galaxy. Therefore, finding new EIGs is crucial for detecting gas loss from star-forming galaxies, which could result in better understanding of galaxy evolution processes. The new research paper authored by Masafumi Yagi of the National Astronomical Observatory of Japan (NAOJ) and his team reveals the presence of new EIGs in Abell 1367 and provides more details on the nature of this cluster. In this paper, the researchers described their observations of the central region of Abell 1367 using the Subaru Telescope in Hawaii. "We surveyed a central 0.6 deg2 region of Abell 1367 cluster for extended ionized gas clouds using the Subaru prime-focus camera (Suprime-Cam) with a narrow-band filter that covers Hα," the paper reads. The observational campaign was carried out in April and May 2014 and resulted in the discovery of six new EIGs in Abell 1367 in addition to five such clouds known before. Furthermore, the data provided by the Subaru Telescope allowed the researchers to find that the Hα tail from the blue infalling group (BIG) is extended to about 1.08 million light years in projected distance, which is about two times longer than previously thought. "The deep Hα image also revealed that the Hα tails are extended in fainter surface brightness much longer than previously known," the scientists wrote. Given the fact that Abell 1367 together with Abell 1656 (Coma Cluster) make up the SCl 117 supercluster (also known as the Coma Supercluster), the team compared this two clusters taking the new results into account. In general, they found that the properties of the EIG parent galaxies in Abell 1367 basically resemble those in Abell 1656. "The comparison of the parent galaxies of EIGs in Abell 1367 and in the Coma Cluster showed that the properties of the parents are basically similar," the researchers wrote in the paper. However, one meaningful difference was found by Yagi's team. They revealed that the length of EIGs is longer and more often connected to star-forming parents in Abell 1367. This indicates that the EIGs and parents in Abell 1367 are, on average, younger than those in Abell 1656. It also means that gas removal from the parent and heating of EIG is slower in Abell 1367. 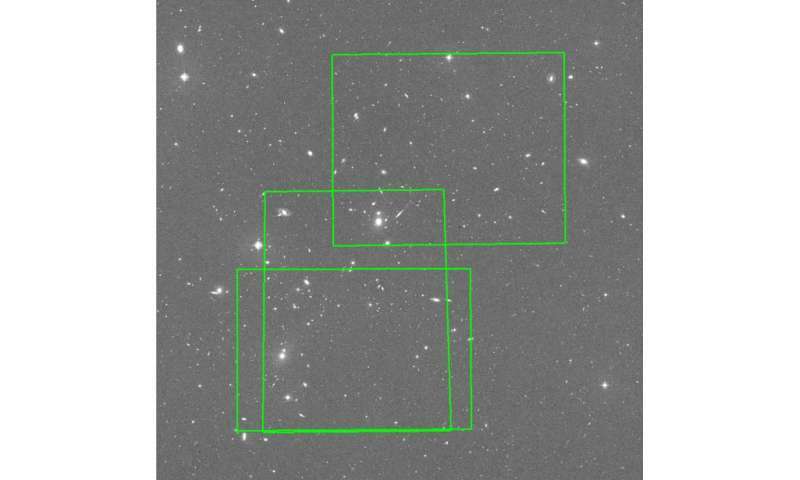 We surveyed a central 0.6 deg^2 region of Abell 1367 cluster for extended ionized gas clouds (EIGs) using the Subaru prime-focus camera (Suprime-Cam) with a narrow-band filter that covers Halpha. We discovered six new EIGs in addition to five known EIGs. We also found that the Halpha tail from the blue infalling group (BIG) is extended to about 330 kpc in projected distance, which is about twice longer than previously reported. Candidates of star-forming blobs in the tail are detected. The properties of the EIG parent galaxies in Abell 1367 basically resemble those in the Coma cluster. A noticeable difference is that the number of detached EIGs is significantly fewer in Abell 1367, while the fraction of blue member galaxies is higher. The results suggest a difference in the evolutionary stage of the clusters; Abell 1367 is at an earlier stage than the Coma cluster. The simple fact that these filaments are consistently observed to be associated with star-forming regions suggests that their study should be a much higher priority. "The deep Hα image also revealed that the Hα tails are extended in fainter surface brightness much longer than previously known"
From what I have read in other comment sections, these "plasma filaments" supposedly extend infinitely long throughout the universe, so why would focusing on them in star-forming centers be more important? Wouldn't it be more interesting to study these "plasma filaments" that are in the middle of nowhere to actually understand what they are actually doing? I would think that would be easier since there would be less outside interference, right? Charge density will be higher in star-forming regions, which should make them easier to see. "... Observations with ESA's Herschel space observatory have revealed that our Galaxy is threaded with filamentary structures on every length scale ..."
"... most filaments are dotted with compact cores, suggesting that stars are readily taking shape in these dense 'fibres' of the interstellar medium, there are also regions that exhibit complex tangles of filaments but no signs of on-going star formation ..."
"... astronomers have detected what appear to be accretion flows, with the most prominent filaments drawing matter from their surroundings through a network of smaller filaments ..."
All of these plasma filament press releases are a bit anticlimactic since that Herschel press release. What charge? These filaments are not current carrying. That would have been obvious from surveys such as WMAP, Planck and COBE. They aren't seen. Ergo, they aren't there. This nonsense has been dealt with before. Re: "That would have been obvious from surveys such as WMAP, Planck and COBE." So, instead of looking to observations of filamentation in plasmas which anybody can see occurs in a novelty plasma globe, you want to discount it because of a model which was created for the specific purpose of proving your creation event -- even though others had previously proposed explanations for this CMB without any need for your violation of energy conservation miracle. You want people to reject the validity of what they can see with their own eyes, so that those observations can be replaced by a faith in the validity of these algorithms -- which were of course generated under the assumption that there are no charge-carrying filaments. You want everybody to ignore the fact that plasmas themselves routinely emit noise like microwaves when they conduct. And you want us to believe that it's somehow more than a creation event because supercomputers and telescopes were involved. "[M]odern technological advances are not imposed problems; they are instead examples of the Texas Sharpshooter fallacy. In other words, the Texas Sharpshooter makes it look as if he had been aiming at the bulls-eye and had hit it, when in fact he drew the bulls-eye only after he took the shots. Modern science and engineering is like that. People do research and development, and then proclaim triumphantly that whatever they have done is a breakthrough. They have achieved whatever-happens-to-come-out-of-R&D; and then they spin, hype and market whatever-happens-to-come-out-of-R&D as if it were a major breakthrough." but you want others to take you seriously? jonesdumb would insist we believe in his faith based thought experiment "science" of his favorite plasma ignoramuses ILO laboratory based known plasma properties and actual scientific method. What is the power source for these plasma filaments? If they are carrying these currents as you claim, and make up the majority of the known observable universe, as well as form stars and apparently cause these huge discharges to carve out canyons, power comets, etc. etc etc, they must have a huge power source. What is that source? Re: "What is the power source for these plasma filaments?" What is the source of your creation event? so you can't actually validate your claim with evidence? Peer pressure to believe in a creation event has no place in science. Part of using science as a tool is in understanding what its limits are. This notion that we can understand what occurred at fractions of a second from the inception of the universe exhibits a failure to consider the realities of this moment in time in modern science. ... but when people apply peer pressure for another to conform to their own preferred creation event, all of it should be viewed with skepticism. What we DO know -- what we can see in the laboratory and with telescopes -- is that cosmic plasmas are behaving as laboratory plasmas. THIS is the domain of empiricism, and those who would have us question it are practicing a form of bias against an established approach in the sciences which has served us quite well for many centuries now. Where have I argued for a creation event? I am asking questions of you to gain a better understanding of your theories, because of the EU guys, you tend to have the most comprehensive responses. It is not argued that there is a lot of plasma in the universe. It is not argued that plasma is an ionized gas. What is argued is what these plasma do and how they interact. Being that the plasma theory is based on an "electric" universe, there has to be a source and a sink. You can't just have electricity out there. It needs a current. To have a current, it needs a source. If you have a source and a current, you need a sink. If it is DC (which i am under the impression it is), you need a voltage differential. any comments on the source, current, and sink? Re: "Being that the plasma theory is based on an "electric" universe, there has to be a source and a sink. You can't just have electricity out there. It needs a current. To have a current, it needs a source." ... because there is no shortage of power sources around us. We see energetic events all over the sky. Power sources are hardly scarce. Recall: Most radio waves are synchrotron, which is electrons spiraling in a magnetic field. And the very subject of this press release is that we see evidence for the transmission of this electricity (aka "gas loss") across space over filaments. The original argument you seem to want to copy is where does all of the energy OF THE UNIVERSE come from? Like I said, it's not actually a scientific question. Take the question to your nearest church. 3- with all MS theories you can find the empirical evidence by simply seeking it in the studies - so why can't you give an answer to 691Boat? since when is "gas loss" equivalent to the transmission of electricity? so, PV panels generating electricity are producing a gas loss? Like I said, it's not actually a scientific question. I fully understand that there are lots of power sources. I also fully understand that the solar wind is a plasma and is composed of the movement of ionized particles in a net neutral composition. What I don't understand is why we don't see huge currents passing out of the sun in a sphere. I also don't understand why we don't see specific filaments coming from the sun going somewhere carrying large currents. If there is electric current passing from the sun to earth, causing events we witness such as the northern lights, what is the Earth grounded to to act as a sink? What causes the sun to have a source voltage? Re: "I also don't understand why we don't see specific filaments coming from the sun going somewhere carrying large currents." Approximately every eight minutes, the two fields briefly merge or 'reconnect,' forming a portal through which particles can flow. The portal takes the form of a magnetic cylinder about as wide as Earth." Call it reconnection if that makes you happy, but it's obviously more than just a "magnetic" portal. Please see wikipedia's entry on plasma scaling. Nobody is claiming that there is a perfect correspondence from one scale to the next. What people are claiming is that filaments in interstellar space (which most textbooks agree by now is mostly in the plasma state) can be understood and explained by studying filaments in the plasma laboratory. Sure, I have no issue with that. They have proof, I will believe it until something comes up to disprove it. What happens during these events every 8 minutes? a large electrical connection through the magnetic portal? As far as I know, when a voltage source gets shorted to a voltage sink, large amounts of current flows. Where is this current going? The EU guys like to say that these currents, or discharges, depending on who you ask, have the power to carve out gorges and canyons. Don't you think that since humans have been observing the skies and the earth, we would have seen one of these events? I mean every 8 minutes over 20,000 years is a lot of chances for a big current to do some work on Earth, no? Re: "If there is electric current passing from the sun to earth, causing events we witness such as the northern lights, what is the Earth grounded to to act as a sink?" "... More than 60 years ago, Dr. Charles E. R. Bruce, of the Electrical Research Association in England, offered a new perspective on the Sun. An electrical researcher, astronomer, and expert on the effects of lightning, Bruce proposed in 1944 that the Sun's 'photosphere has the appearance, the temperature and the spectrum of an electric arc; it has arc characteristics because it is an electric arc, or a large number of arcs in parallel.' This discharge characteristic, he claimed, 'accounts for the observed granulation of the solar surface.' Bruce's model, however, was based on a conventional understanding of atmospheric lightning, allowing him to envision the 'electric' Sun without reference to external electric fields." "Years later, a brilliant engineer, Ralph Juergens, inspired by Bruce's work, added a revolutionary possibility. In a series of articles beginning in 1972, Juergens suggested that the Sun is not an electrically isolated body in space, but the most positively charged object in the solar system, the center of a radial electric field. This field, he said, lies within a larger galactic field. With this hypothesis, Juergens became the first to make the theoretical leap to an external power source of the Sun. Juergens proposed that the Sun is the focus of a "coronal glow discharge" fed by galactic currents. To avoid misunderstanding of this concept, it is essential that we distinguish the complex, electrodynamic glow discharge model of the Sun from a simple electrostatic model that can be easily dismissed. Throughout most of the volume of a glow discharge the plasma is nearly neutral, with almost equal numbers of protons and electrons." Sunspots, prominences, coronal mass ejections, and a host of other features require ever more complicated guesswork on behalf of the fusion model. But this is the way an anode in a coronal glow discharge behaves! In the electrical model, the Sun is the 'anode' or positively charged body in the electrical exchange, while the 'cathode' or negatively charged contributor is not a discrete object, but the invisible 'virtual cathode' at the limit of the Sun's coronal discharge." "(Coronal discharges can sometimes be seen as a glow surrounding high-voltage transmission wires, where the wire discharges into the surrounding air). This virtual cathode lies far beyond the planets. In the lexicon of astronomy, this is the 'heliopause.' In electrical terms, it is the cellular sheath or 'double layer' separating the plasma cell that surrounds the Sun ('heliosphere') from the enveloping galactic plasma. In an electric universe, such cellular forms are expected between regions of dissimilar plasma properties. According to the glow discharge model of the Sun, almost the entire voltage difference between the Sun and its galactic environment occurs across the thin boundary sheath of the heliopause. Inside the heliopause there is a weak but constant radial electrical field centered on the Sun ..."
"A weak electric field, immeasurable locally with today's instruments but cumulative across the vast volume of space within the heliosphere, is sufficient to power the solar discharge. The visible component of a coronal glow discharge occurs above the anode, often in layers. The Sun's red chromosphere is part of this discharge. (Unconsciously, it seems, the correct electrical engineering term was applied to the Sun's corona.) Correspondingly, the highest particle energies are not at the photosphere but above it. The electrical theorists see the Sun as a perfect example of this characteristic of glow discharges—a radical contrast to the expected dissipation of energy from the core outward in the fusion model of the Sun. At about 500 kilometers (310 miles) above the photosphere or visible surface, we find the coldest measurable temperature, about 4400 degrees K."
"Moving upward, the temperature then rises steadily to about 20,000 degrees K at the top of the chromosphere, some 2200 kilometers (1200 miles) above the Sun's surface. Here it abruptly jumps hundreds of thousands of degrees, then continues slowly rising, eventually reaching 2 million degrees in the corona. Even at a distance of one or two solar diameters, ionized oxygen atoms reach 200 million degrees! In other words the 'reverse temperature gradient,' while meeting the tests of the glow discharge model, contradicts every original expectation of the fusion model. But this is only the first of many enigmas and contradictions facing the fusion hypothesis. As astronomer Fred Hoyle pointed out years ago, with the strong gravity and the mere 5,800-degree temperature at the surface, the Sun's atmosphere should be only a few thousand kilometers thick, according to the 'gas laws' astrophysicists typically apply to such bodies." "Instead, the atmosphere balloons out to 100,000 kilometers, where it heats up to a million degrees or more. From there, particles accelerate out among the planets in defiance of gravity. Thus the planets, Earth included, could be said to orbit inside the Sun's diffuse atmosphere. The discovery that blasts of particles escape the Sun at an estimated 400- to 700-kilometers per second came as an uncomfortable surprise for advocates of the nuclear powered model. Certainly, the 'pressure' of sunlight cannot explain the acceleration of the solar 'wind'. In an electrically neutral, gravity-driven universe, particles were not hot enough to escape such massive bodies, which (in the theory) are attractors only. And yet, the particles of the solar wind continue to accelerate past Venus, Earth, and Mars. Since these particles are not miniature 'rocket ships,' this acceleration is the last thing one should expect!" "According to the electric theorists, a weak electric field, focused on the Sun, better explains the acceleration of the charged particles of the solar wind. Electric fields accelerate charged particles. And just as magnetic fields are undeniable witnesses to the presence of electric currents, particle acceleration is a good measure of the strength of an electric field. A common mistake made by critics of the electric model is to assume that the radial electric field of the Sun should be not only measurable but also strong enough to accelerate electrons toward the Sun at 'relativistic' speeds (up to 300,000 kilometers per second). By this argument, we should find electrons not only zipping past our instruments but also creating dramatic displays in Earth's night sky." "But as noted above, in the plasma glow-discharge model the interplanetary electric field will be extremely weak. No instrument placed in space could measure the radial voltage differential across a few tens of meters, any more than it could measure the solar wind acceleration over a few tens of meters. But we can observe the solar wind acceleration over tens of millions of kilometers, confirming that the electric field of the Sun, though imperceptible in terms of volts per meter, is sufficient to sustain a powerful drift current across interplanetary space. Given the massive volume of this space, the implied current is quite sufficient to power the Sun ..."
Understanding the electric sun hypothesis requires careful attention to detail. There are many opportunities to misunderstand the idea. It is, simply put, the application of observations of the laboratory glow discharge to a very large spherical geometry. Re: "The EU guys like to say that these currents, or discharges, depending on who you ask, have the power to carve out gorges and canyons. Don't you think that since humans have been observing the skies and the earth, we would have seen one of these events?" No, and that is the uniformitarian assumption within you making the suggestion. We've been endowed with a very complex thinking machine. This idea that since things are this way now that they have always been this way could be the last thought we ever have -- if we let it be. So your defense is that the electric field is so weak we cannot possibly measure it? Got it. What makes the sun have a net positive charge if all the plasma it discharges in net neutral? Seems like an awkward imbalance that shouldn't exist. So the theory is that "there is no fusion in the sun, but it has a tiny electric field over vast amounts of space and emits a solar wind that carries enough current to carve out craters and canyons, but it is too small to measure, so you can't possibly disprove it. Also, it releases enough light, heat, energy, etc to have an influence across millions of miles, but you still can't measure it"? Also, you still haven't said what powers the sun if it isn't fusion, and why Earth is a ground. Re: "What makes the sun have a net positive charge if all the plasma it discharges in net neutral? Seems like an awkward imbalance that shouldn't exist." At this point, different theorists will start to go into different directions. Re: "So the theory is that 'there is no fusion in the sun, but it has a tiny electric field over vast amounts of space and emits a solar wind that carries enough current to carve out craters and canyons, but it is too small to measure, so you can't possibly disprove it.' ..."
No, they leave room for fusion to contribute some fraction of the Sun's total energy. They're not ideological about it. They consistently try to avoid getting ahead of the data. There are too many people watching every statement they make. People have been picking apart every sentence of these articles since they were written (on both sides of the fence). There is tons of introspection. They leave room for it to contribute some energy, eh? That's very polite. Where is the rest of the energy coming from? It seems you go back and forth between the Sun being a power source and the sun requiring some sort of external power. Also, as a side note, I'm not going to take your blog as evidence towards EDM. The EU folks keep saying that it is a plasma-based system, but something HAS to power the plasma. The plasma I generate in my lab takes a whole lot of energy to create and sustain. It doesn't get created and just hang out and float around causing EDM events. What powers your huge plasma fields if only a fraction of the sun is due to fusion? I was introduced to most of these arguments around the 2005 timeframe. I immediately started running them by people like Tom Bridgman, Nereid, Tim Thompson, Leroy E and others. The process was to observe the responses for items which have not yet been published anywhere (novel arguments). What I found is that very few people have put enough thought into these claims to come up with novel rebuttals. What most people do online is they look for a site that debunks it, and then they start quoting that site. I would see the same arguments put forward over and over. When I thought I found something new, I'd forward it to them. Then, I observed THEIR responses. This is the process that EVERYBODY should be going through. By not doing this, people are forced to place faith into somebody else's beliefs. The only way to determine for yourself is to -- either formally or informally -- map the debate out. Eventually, I realized that it's a great idea for a social network. Re: "I'm not going to take your blog as evidence towards EDM." What I do is I organize the information. You (and many others actually) are clearly having problems tracking this information down on your own. Why am I here? What role am I serving, you think? But, that means that something is wrong. What has been put forward is not solving the problem it was designed to solve: the information is all spread out. There is something missing, organizationally speaking, here. I can tell you that with confidence because I see people online making arguments that were long ago shown wrong. The challenges you've put forward here have been put forward countless times. In 90% of the cases, the answers are already known. But, the information is not organized in such a manner that it helps you to answer your questions. One person will look at that as an opportunity to prove the textbooks. I see it as an information design challenge. We can think about the topic on different levels. We can treat the debate like a knowledge problem by merely consulting the textbooks. But, then we are ignoring that science is also a tool for thought -- not just a system of belief. We can alternatively look at what's happening with controversies in the media and sciences and ask: Is the Internet properly supporting our own need to self-actualize? Can a person -- given what is happening today online -- use the Internet to formulate their own personal opinion on some complex scientific controversy? I would argue that the latter is a very important and noble question to ask. All of you guys are operating at this level of the technical arguments. I am designing a social network based upon my observations and interactions (over 12 years now). I am trying to create something which has never before been created -- and which probably people think is impossible. If it works, it would help BOTH sides of the debate. By figuring out how to bring order to this vast system of opposing arguments, we can figure out how to create systems which streamline the process of argumentation. What I encourage you to do is to exit the level of technical details, and think more meta about what you've seen. The person who gets us onto a better track on this problem will solidify their place in history. This moment in time is marked by ideology. If we can create systems which generate novel arguments over time, then we can boost innovation within the sciences, more broadly. This is not just about the Electric Universe. This is about ALL of the scientific disciplines. This is much bigger than just the EU. If at the end of the day, the EU is shown to collapse of its own weight, or transform into something quite a bit different, that is how science works in practice. What we should be shooting for is to create the system which makes the process efficient. "So, instead of looking to observations of filamentation in plasmas which anybody can see occurs in a novelty plasma globe"
More like DrunkSurfer or just TrollingSurfer, going by your curt insensible shite dump. If you had been sober or a non-troll loser, and properly read/understood the KNOWN science aspects involved and CONTEXT in which your excerpted quote was made, you wouldn't have anything to post at all....except for maybe a gratuitous fart or two just to make sure everyone knew the level of 'intellectual discourse' you operate at so far. Piss off, loser. Your kind has had its day. The net/forum is no longer yours to clutter and pollute with your malignant and infantile drivel. Either take the trouble to understand and respond fairly, or not at all. Thanks. "The net/forum is no longer yours to clutter and pollute with your malignant and infantile drivel"
Poor troll. Acting innocent and whining won't change the fact that I was quietly reading this thread when suddenly you popped up and troll-shited in it. I merely pointed out your troll shite and observed your 'contribution' so far: that you troll-shited and made no attempt to properly and respectfully read/understand/engage objectively on science points being discussed by others. As for me "following you to another thread", you even got that back-to-front! It was YOU posted unprovoked insulting remarks about ME in that "other thread". I responded. That is how it works here, Zerg. Maybe you, being an ego-driven 'cheap shot' troll that you have demonstrated yourself to be so far, are too occupied trying to curry favor with the other troll and bot-voting 'gangmembers' to see that you are wrong on that simple thing too. How can you pretend to be in any way 'competent' to make "assessments" about anything or anybody? Trolling is no substitute for competence, Zerg. so, instead of always ignoring the questions, why not answer, since you have been studying this in-depth for well over a decade, what powers the electric sun!? It's not all fusion, you already admitted that. It's not plasma itself, because I know that plasma is not self-sustaining. Seems like step 1 should be what sustains the circuits and voltage differentials in EU? kid: "Dad, how does the lamp turn on?" dad: "Electricity flows through the light switch when I flip it on, son." kid: "Where's the electricity come from?" dad: "From the wall, of course!" kid: "Where does the wall get the electricity?" dad: "The wall obviously gets its power from the electrical panel in the basement, you electricity ignoramus!" kid: "where does the electrical panel get it's power?" dad: *shrugs shoulders* "Magic. Question time is over." It's not plasma itself, because I know that plasma is not self-sustaining. There is it, your preconceived notions have answered your question before you have had a chance to get an answer. If plasma is "not self-sustaining", why is it when we actually look we see 99.9999% of the Universe is in the plasma state? It would be a far easier argument to claim the opposite based on observation, that a neutral state is not sustainable and only attainable given very specific conditions. Such as the very limited conditions present where your experience is relevant, Earth's atmosphere. Other than Earth, there is likely no other environment in the entire solar system which can support all four known phases of matter simultaneously. Somehow though, due to your experience with plasmas we should cast aside the idea that 99.9999% of the Universe is in the plasma state. 10-4 Tonto. Seems like step 1 should be what sustains the circuits and voltage differentials in EU? Don't forget the intelligent drift electrons, that are supposedly the power source for this lunacy. They remain undetectable due to being able to exactly match the velocity of various spacecraft, and thereby avoid detection! It is, of course, all complete nonsense. Initially it was claimed that there was a huge potential difference between the Sun and the heliopause. Then it was pointed out that such a potential would accelerate the electrons to relativistic speeds. They'd be very detectable. And quite nasty on the dark side of various planets. So then they became 'drift' electrons. However, the morons failed to realise that the spacecraft that would detect them are not stationary, and are moving at many km/s! And so it goes on. Nonsense following nonsense, and not the tiniest bit of evidence, or rational science, to back it up.
" Acting innocent and whining won't change the fact that I was quietly reading this thread when suddenly you popped up and troll-shited in it"
Oh, and learn the difference between the Zerg and a ZergSurfer, google will be your friend. Ah what the hell, I'll give you a clue. You know the Pamplona bull run, the bulls and folks running with them are the Zerg. We dance on the backs of the bulls. Acting innocent and whining won't change the fact that I was quietly reading this thread when suddenly you popped up and troll-shited in it"
...We dance on the backs of the bulls. So you "chuckle" as you pile more troll-shite onto your previous dump here, on a science thread discussion in a science forum. How sad is that, Zerg? And when no-one can tell the difference, between what those Bulls dump onto the streets there and what you dump onto PO floors here, then you have 'achieved' an 'equivalence condition' only ZergSurfer's 'troll-shiting' buddies could be 'proud' of. Sadder and sadder, Zerg. But you only registered as ZergSurfer late last month. So if you are "an old hand here", you must have posted before under other username(s). So do tell the Forum: How many usernames and what were they? Thanks. If plasma is "not self-sustaining", why is it when we actually look we see 99.9999% of the Universe is in the plasma state? so... the sun is a self-sustaining plasma arc or some similar discharge? and that makes sense to you because why? can you show any self sustaining plasma discharge from any reputable plasma physics labs? can you show where the radiation from said self sustaining superspark is a scaled version of our sun? My previous ID here was TehDog. Surely, you must have known that. After all, you have a toe. jonesdumb prefers wilful ignorance to actual science, as such he would prefer to ignore NASA discoveries that don't agree with his beliefs. Well, I think if we take our biggest telescopes and look in all directions we will see the immense Universal Cathode and Anode. Thanks for your honesty on that at least, Zerg. As for the rest, your flippant irrelevant remark intimating 'insights into a toe' are also a basis for 'prescience re your past usernames', is commensurate with the worst of the old @TehDog one-liner troll-shite irrelevances you used to post under that username. And it's a bit hypocritically-rich for you (and the gang of like troll-shiting 'gang' members) to be so 'precious' now about delving into others 'past'; especially after all the times Zephir wasb stalked and harassed ect about his 'past'? Besides, it was YOU claimimg to be "an old hand here" in one of your unprovoked insulting posts wherein you used that "old hand here" as some sort of 'supporting' il-logics for making the erroneous 'assessment' claims about me. So again, you have only your big ego-mouth to blame, haven't you? Do/Be better. It's way passed time both 'sides' got together and compared notes as to what EU claims/aspects you agree/disagree on. THEN COMPARE the two 'sides' lists and TICK OFF those items which ALL agree/accept. THEN concentrate further (polite and respectful) science-based discussion ONLY ON THOSE OUTSTANDING ITEMS in contention because 'one side' accepts them and the 'other side' not. "Thanks for your honesty on that at least, Zerg. As for the rest, your flippant irrelevant remark intimating 'insights into a toe' are also a basis for 'prescience..."
Get it straight, Zerg: I don't personally like/dislike re science; I merely observe objective reality and call it like it is. That is where we differ in our approach to discourse on science matters, Zerg: I apply Objective Scientific Method whilst YOU 'apply' Subjective Personal Likes/Dislikes Method! Haven't you twigged, Zerg? This is a SCIENCE site/discussion forum; NOT a social media site for likes/dislikes-motivated juveniles trying to get as many 'friends' as they can by saying and doing whatever it takes to get them their '15-minutes of fame' among their equally juvenile peers? How old are you? Anyhow, mate, what are your thoughts on my suggestion above aimed at 'defusing' otherwise resolving as scientifically/amicably as possible the interminable disagreement/arguments/fights etc which invariably arise/perpetuate between the various protagonists/antagonists whenever the 'topic' and usual 'claims/counter-claims' re EU, Plasma Universe etc brought up by either 'side' involved in the rancorous and prolonged 'feuds'? It's a stupid idea. It would lend legitimacy to a set of beliefs that are demonstrably wrong. "How old are you?" Old enough to be a great grandfather. the scientific method will allow eu claims if they're substantiated by evidence, especially if they're validated... so why aren't they? I am looking forward to the evidence that plasma is self-sustaining. It would seem that if this were the case, fusion would be so very much simplified, no? In summary, the plasma you like to think are out there contain enough energy to carve out canyons, power the entire universe through a voltage differential so small it is not measurable by today's instruments, and provide and replenish its own power. wow. I can see why you think plasma is so amazing now. That is quite the feat! I am looking forward to the evidence that plasma is self-sustaining. I am looking forward to you explaining why when we look we see that 99.9% of the Universe is plasma but somehow it is not self-sustaining. You clearly cannot see beyond your own (claimed) laboratory. It would seem that if this were the case, fusion would be so very much simplified, no? I would guess you believe 2+2=fish with that asinine comment. Given the required charge differential, yes, electric discharge can do so. Nice strawman, you're starting to sound like a cockpuppet of jonesdumb and Cap'n Stoopid. and provide and replenish its own power. You would think that someone who claims a plasma laboratory would understand the electromotive force created when plasmas/electric currents flow across magnetic fields. Me thinks you are little more than another liar like jonesdumb, et al. @691Boat, you ask good questions. @Hannes apparently thinks the power in the Sun comes from electric currents from "out there somewhere." What's not clear is exactly where. As you say, current doesn't just somehow exist. There's a source and a sink, and no amount of handwaving can fix the lack of them. The largest coherent structure in the Solar System is the heliospheric current sheet, this along with polar currents detected by Ulysses and the electron drift measured by Voyager 1 provides more than enough current to power the Sun. "with an estimated galactic current of 10^17 - 10^19 Amps", there is plenty to power the Sun. The inability to to grasp these concepts is based on ignorance of plasma physics and an unwillingness to objectively research the phenomena. Immaterial unless you either a) admit all the power comes from fusion in the Sun or b) claim some other power source and prove it. Which is why I call you @cantthink69. A) What "proof" do you have the Sun is powered entirely by fusion at the core? Other than by proclamation by some dead guy who grew up in the gaslight era, of course. Also, please explain what this in-flowing heliospheric current sheet has to do with the Sun's hypothesized core fusion model. "The presence of a persistent radial current component is associated with the azimuthal field component and implies a net outward flow of millions of amperes. This outflow is compensated (the current is closed) by bulk radial currents flowing sunward above and below the current sheet...."
That must be one of those electric currents that don't do anything, according to astrophysicists. Guys! Guys! I can't believe you guys (on BOTH 'sides') are STILL trying to restrict the energy source to one particular over another! How many times have I pointed out that all the phenomena began with the 'unsettled relativities' inherent in the infinite universal energy-space extent of quantum states which are eternally mobile and NEVER at REST? And that all phenomena is therefore a HYBRID PROCESS having stages where one force is dominant and then another etc....in an ever changing/fluxing state of recycling up/down the infinitesimal-to-infinite scale of the universe....meaning that whatever scale you are observing must have a commensurate scale of temporal/spatial extent/evolution over which a particular force or other may become the dominant one AT A PARTICULAR stage in the evolutionary trajectory, be it over milliseconds; billions of years; or whole epochs humans cannot YET probe across. Ie, not only 'gravity', but also EM-radiation IONIZATION creates DYNAMICS. HYBRID! Well, your buddy Hannes said that the voltage drop is so small it can't be measured. Shall I link you to that thread? So my "strawman" is actually the EU's strawman. WRT the plasma I generate, It is due to laser irradiation. The intensities I need to generate plasma and see the subsequent effects of plasma shielding are well above the MW/CM^2 level. But for some unknown reason, whenever I turn off the laser or go below that level, I can't seem to sustain the plasma, almost like it is not self-sustaining and requires an external power source to maintain. I can even keep pumping 5 9's Oxygen in there and it still doesn't sustain itself. WRT the plasma I generate, It is due to laser irradiation. The intensities I need to generate plasma and see the subsequent effects of plasma shielding are well above the MW/CM^2 level. But for some unknown reason, whenever I turn off the laser or go below that level, I can't seem to sustain the plasma,.. I realize that was a sarcastic 'rebuttal' to cantdrive etc, but you just unwittingly confirmed what I observed above for all you guys, on both sides. - deep space environment is replete with high-energy/velocity 'cosmic ray' matter (electrons, neutrons, protons, Kaons, pions) which ionize gaseous/plasmic clouds of molecules and dust. - hence in-space IONIZATION action NEVER 'ceases'; ALWAYS drives 'unceasing' dynamics (as Gravity does too).
" I can even keep pumping 5 9's Oxygen in there and it still doesn't sustain itself." I'll leave others to explain why that's important for plasma research. Go ahead and help your buddy out then, RC. Where do these circuits get the power they need to power the sun, apparently flow THROUGH the sun and power our solar system with enough current to perform all the magic CantDrive claims his plasma universe plasma can do? It confirms what I reminded above for benefit of BOTH 'sides'; so cantdrive, and you, will think/speak for yourselves now that you understand this. Re "buddy": Please be aware I come here to read, discuss, observe science/logics news/reviews/insights; not to join 'gangs'/find "buddies" or whatever else distracting and irrelevant things others may 'like' doing in lieu of following strict objective/impartial principles of science method. It's a thankless approach at times. -Current flows in and out of the sun from an unknown source. -Planets and such are at a voltage differential relative to the sun, but nobody can say why they are "grounds"
-as of yesterday, our atmosphere is now a plasma according to CD. Thankyou for your timely, courteous reply elaborating on your issues with cantdrive et al's claims. I too have some issues with some of those claims. But some are ok as far as known science (which I have had occasion over the years to remind BOTH 'sides' of) is concerned. It is precisely because of the many varied claims/counterclaims and personal insult streams (which have 'grown like Topsy' over the decades of feuding and cross-purpose egotistical pointe-scoring instead of reasoned debate on scientific merits), that I, in exasperation, made the SUGGESTION in my post earlier above (on April 08). Did you see it? ZergSurfer merely dismissed it because he claims it would "add legitimacy etc etc" to 'beliefs' (in toto) of EU plus Plasma Universe; without even considering what 'bits' may be 'good' (just as many Mainstream theories/hypotheses have had 'good' bits as well as 'bad' bits). My suggestion was aimed at stopping 'feuding' and encouraging true discourse. trying to scale a plasma globe you hold in your hands to the size of galaxy. So your 'personal method' is to insult, ignore and exclude your 'targets' from the scientific discourse because you don't understand all of what you and others are actually saying? Bad. PS - how is that maths free ToE and saving the world from climate change working out for ya ? It's such 'elistist', 'exclusionary' attitudes and discussion 'sabotage/censoring' tactics that led to Bicep2 'team' to make such a BAD mistake; based on ego, bad assumption/interpretations; which DECADES of BAD SCIENCE built into LITERATURE as if it was all 'fact'....but much of which was just WRONG. More recent MAINSTREAM science discovery/review is increasingly showing just how WRONG it was....and YET 'the gang' here want to keep pretending nothing has happened! They are in denial and just as deluded as that Bicep2 'team' were; because they still 'believe' what they were told long ago....which was always wrong and never really scientifically/logically/consistently tenable AT ALL at ANY stage. you can't even validate the 4 fatal flaws you "saw"
How can anyone ever get through to you if you refuse to look! It's all there. You don't want to find it. You just insult and pretend you are relevant in any way whatsoever to true science/logics discourse based on objective merits and not 'person/source'. Your "validation" requirement must have regard to the system of validation. When that system is broken (ie, professional peer review which 'passed' Inflation and much more RUBBISH into the Literature for DECADES) it's NOT something to be touting whilst insulting others who want to discuss objective merits not your personal requests/demands for 'validation' by your much touted review system WHICH HAS BEEN BROKEN FOR DECADES. Do you even 'get' that, Stumpy? Or is it too unpalatable to chew on for long enough to realize that your posts and insults are IRRELEVANT NOISE so far. If you can't contribute POLITELY and OBJECTIVELY without BOT-VOTING and TROLL-SHITING all over the place here, then just LISTEN and LEARN. i shudder to think a troll could produce evidence !!!! So do stop pretending you even looked, Stumpy. No-one believes you on anything now. Your own fault. Ok? PS: Re Bicep2 flaws: I already mentioned them in discussions/exchanges with others since. You missed them all? Hell, I even mentioned one most crucial flaw in my response to @imfromcanada recently! so that is a no then? so you don't want to actually validate your claims and show everyone just how wrong i am? well then you can link that thread! Waste of time, Stumpy. Been there, done that, too many times. A waste of time because you never look. You claim to have all my posts cached, but you NEVER LOOKED, did you, for the mention of those flaws which were dispersed among other discussions/threads/topics since Bicep2 fiasco erupted. You even can't find the latest mention to @imfromcanada, just a FEW DAYS AGO in a thread where YOU were busy troll-shiting and insulting while missing the very thing you claimed to want from me. How can anyone believe or trust anything you claim, Stumpy; when it's clear and loud that you don't look. When you are told, you just deny and insult as usual. Please stop wasting everyone's time, Stumpy. I certainly am not going to plough through all the posts since March 2014 just so you can ignore, insult again, Stumpy. Do your own due diligence. And stop making so much time-wasting noise and cluttering the threads by forcing me to defend against your trolling, bot-voting and lying about me. Typical. Let's a machine do the work instead of doing it yourself. You bot-vote and you insult and you miss it all because of your own "TL ; DR method" of 'discourse'....and then you come bleating for me to go back and do the work for you too? What hypocrisy and laziness from the get-go! You should have been paying attention all along; not just employing 'gang' tactics for censoring, sabotaging the discourse. If you now come back denying that too, then you must really be 'far gone'; too far gone to realize your skewing the ratings metrics on a science site is BAD; using the '1' campaign to 'hide' my posts from readers who set their filters to 2.5 or higher, is BAD; your intentional troll-shiting, cluttering distractions trying to 'bury' otherwise interesting discussions which challenge your 'ego', is BAD. Stumpy, have you even stopped to consider WHY mainstream is now increasingly confirming me correct all along, on many fronts? I've done the work. You haven't. Can you not see how dishonest you look!!! Either link some evidence for your claims or SHUT UP! Otherwise, your behaviour on this thread can only be seen as the very definition of trolling. @CD85: The great part is that all the new information I get is from you and Hannes/Reeve, so you only have yourselves to blame. I notice you never actually try to refute anything I say, you simply ignore the questions I post. This is your chance to clarify the misinformation with actual science, evidence, and proof! Take advantage of it and set me straight! so you can't find anything, eh? but you want everyone to believe that you're correct? so, how, exactly, is anyone supposed to believe you about how "correct" you are when you can't actually substantiate your claims with specifics? that makes you... what, exactly? That's rich, mate. You, Stumpy et al have ignored, bot-voted, attacked, insulted, sabotaged and lied about me and my observations which you missed/denied, and now you say I am the one looking "dishonest"? What planet do you live on, RNP; where I post info and you ignore/deny it then feel ok about accusing me of dishonesty? RNP, did you read my above post to Stumpy? I described one of the Bicep2 flaws in my response to @imfromcanada just a few days ago! Stumpy was trolling/insulting/cluttering/lying in that thread, as usual, BUT he says I never mentioned a flaw because he had all my posts. Either he must be blind or he never looked to see what was posted, as per his 'method', ie: "TL : DR" (too long, didn't read). And I defend as necessary; if you don't like that, then stop your lying/insulting/bot-voting etc.